So, why devote all this verbiage to crustaceans? Because we support and call for humane treatment of animals in our column, whether they’re eaten by people or left to roam the planet, and we think it’s all connected to the way humans treat one another. A new game recently came to town and left faster than a lobster rolls. We use the term game loosely, because whether your canines get a carnivorous workout three times a day or you’re so vegan that you hesitate to eat the bacteria in yogurt, we shrink at the thought of any human being taking joy in plugging money into a machine, grabbing a living creature by his or her claw with a plastic one, and maneuvering the poor thing toward the mouth of a chute and ignominiously dropping it down to death by boiling water, possibly compounded by fractures. Even more disturbing is the permitted use of the machines by children. 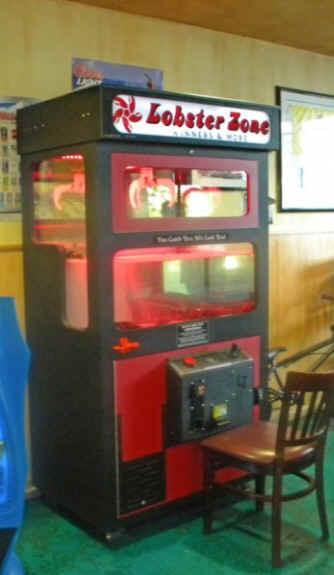 One manufacturer’s name of this machine is Lobster Zone. It’s not the only company that cooks up this macabre form of entertainment, but most of the restaurants in L.A. and Orange counties that house such games use this brand. The Lobster Zone machines, according to the manufacturer’s Web site, were carefully conceived and designed for the health and safety of the lobsters, allowing the animals to sit “contentedly” in their tanks without food as they absorb “nutrients” from the water. There’s also a “pneumatic system that allows the claw to close beneath the water surface in the tank — not before the claw meets the water” as opposed to an electrical system which could electrocute the poor beast — nice of them to think of that. The site offers a plethora of educational facts about our friend the lobster, whom we’re about to send tumbling down a tunnel as it no doubt screams the way Cindy Wilson did in the near-eponymous “Rock Lobster.” On a printed sheet from the company that’s available near the machines, obviously hurried out to fend off the flak from protestors, there’s a promise to install “educational signage near the games designed to help educate customers and restaurant staff about crustaceans and the environment in which they live.” This is reminiscent of the feeling you might have when you exit the Aquarium of the Pacific and the company of all your marine-life buddies and face up with Bubba Gump’s. On the same info sheet is the statement that the machines were designed in conjunction with marine biologists, but several weekday phone calls to company owner Ernie Pappas’s number in Florida was answered with a message followed by a “mailbox full” announcement after the beep. Click here http://www.thelobsterzone.com/ to read all about the machines and see a few photos of the folks who had such a good time getting their dinners from them and judge for yourself, not that we had any input about this, you understand. The site’s button for media items reveals a page for a nationwide protest by PETA and PETA has its own page for it. 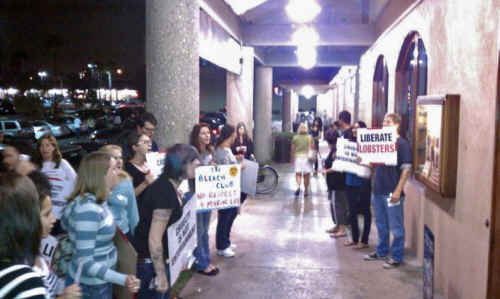 On Oct. 2, about 30 protesters from OCPA parted the Orange Curtain and had a reportedly peaceful event in front of the Beach Club Sports Bar and Grill at PCH and Channel Drive, with police in attendance and a couple of expected comments from tipsy restaurant patrons. Previously, OCPA had contacted the Beach Club and other businesses in and outside of Long Beach that housed lobster gaming machines. At least one eatery voluntarily removed its machine, but the Beach Club would not, stating that the lobsters in the machine were farm fed and bred to be eaten, and that OCPA had every right to protest but that they had the right to keep the machines in. After all, they reasoned, there are people who don’t like sports or liquor, but they’re not going to stop showing or serving them. Another protest was planned for Oct. 9, but during the week, the Beach Club suddenly removed its Lobster Zone machine. Yeah, okay, we know—it’s just a lobster and they are farmed to be eaten, they’ll get eaten anyway, and there are more problems in the world than worrying about a lobster. So, why devote all this verbiage to crustaceans? Because we support and call for humane treatment of animals in our column, whether they’re eaten by people or left to roam the planet, and we think it’s all connected to the way humans treat one another. This is no soapbox stand for vegetarianism—what you eat is a matter of perception. But making a game out of any creature’s death is unsettling and certainly the wrong message to send to children. This is not the path to humane education; it’s the difference between swatting an annoying housefly and trapping him in your hands and slowly pulling his wings off. “It’s hard enough for me to explain to her why the lobsters are in a tank, but to take an animal and torture it even more—that’s not a game,” said an acquaintance with a six-year-old daughter, both of whom wanted to remain anonymous. Native Americans hunted, but a number of tribes honored and thanked each animal for giving its life. Though lobsters don’t figure in the kosher slaughter ritual and although there has been debate over pain caused by the killing, the Old Testament contains a number of humane advisories, such as not cooking a calf in its mother’s milk, emphasis on the sanctity of all animals, and the requirement of the kosher butcher to be a pious Jew who believes that the animal is laying down its life to serve the community. Noted animal science professor Temple Grandin said this about farm animals: “I feel very strongly that we owe agricultural animals a decent life and I will be the first to admit that some agricultural practices need to be changed.” (“Animals Are Not Things”). There has been at least one study done that says that crustaceans do indeed feel pain and fear when their appendages are twisted off (gaah), so why compound that pain with anxiety? You want a nice thermidor? Go ahead — we probably won’t join you — but don’t eat the animal’s stress with the brandy sauce. We’re grateful that organizations like OCPA will continue to make sure that the lowly lobster has a claw to stand on in the rest of the area. “For now, Long Beach is Lobster Zone-free,” Simon said.